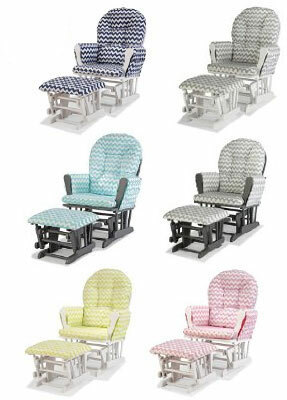 So let’s talk about nursery rocking chairs or nursery gliders for a bit (a.k.a breastfeeding chairs or nursing chairs). They’re quite the essential piece of nursery furniture in a nursery, right along with the baby crib and dresser. Out of all the glider chairs available, it really only comes down to the best 5 brands in glider rocker chairs on the market. Having a glider rocking chair to nurse your and rock your baby to sleep is super important. Let’s say you don’t get a rocking chair for your nursery and you’re not a co sleeping mother; i’s 2 a.m. and the baby is awake again. You walk down the hall in to the nursery to get your newborn. You’ve changed him but he’s still fussing; he wants to eat. So now you take your baby and go find a spot on the couch, chair or lounge somewhere, fuss with the nursing pillow and trying to figure out how to get comfortable and in to a good position to feed this hungry little one. You finally do and he’s fast asleep, now to get him back to his crib. You get up and start walking down the hall and as you move your arm to push open the door, he wakes up again. Back to the couch to rock him back to sleep. 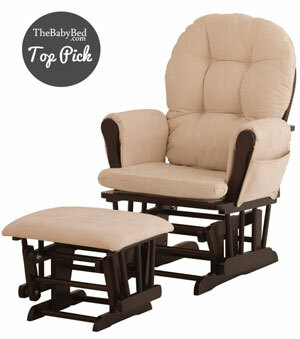 Having a rocking chair in the nursery makes night time so much easier for both YOU and YOUR BABY. With so many glider with ottoman options out there, you’re probably wondering where to start looking and what you should be looking for. Since shopping for a new baby is stressful enough, we’ve helped narrow down the best nursery glider chairs for 2017 for you. There is over 20 colors and combinations available! Click here to view all! 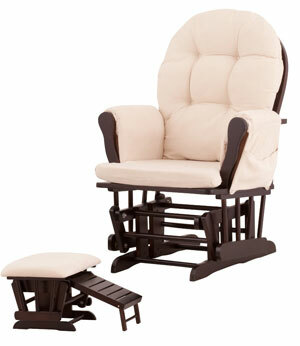 We’ll start with the best nursery glider / the best selling nursery rocking glider and ottoman set. 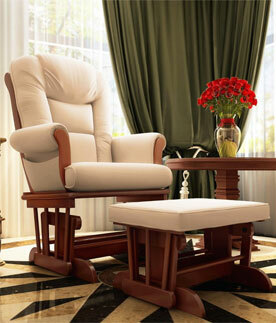 This nursing glider chair is made by Stork Craft. Why is it the best seller? It offers parents affordability! It gets the job done for a great price. Affordable: This wooden glider rocking chair is economically priced and has great reviews (Check Latest Price Here). It has cushioned arms as well as the seat and the back and it has plenty of room. The space between the cushiony arms is about 20 inches. Storage: This Stork Craft upholstered glider not only comes with an upholstered ottoman, but it also has a pocket on the side for your things. This chair is made of wood and is of excellent quality and priced very well (Check Price). You can’t beat the value, hence why it’s No.1 on the list. Space: While this nursery chair doesn’t recline, it is still the perfect option for any parent who wants something basic and more reasonably priced. The amount of cushion and space in this chair makes it perfect for the new mother who will be spending so much time sitting in it with her new baby. Padding: The padding on the arms is perfect for resting your arms while you’re rocking your baby to sleep or while you’re feeding them. The padding on the back of the seat is comfortable enough to sit for long periods of time without pain or discomfort. Easy to Assemble: Stork Craft also made this baby feeding chair easy to assemble, as it does not come already put together, but many parents said it was easy enough for them to put together by themselves even towards the end of their pregnancy. 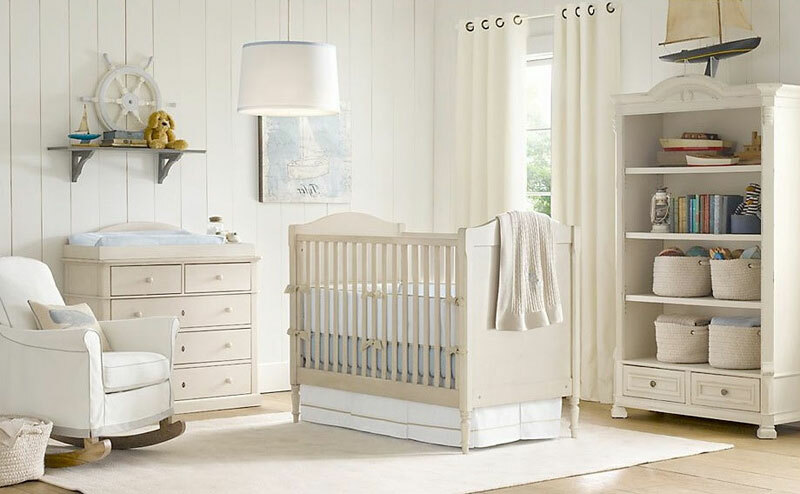 It’s obvious why this product is so popular, you can’t beat the quality for the price making it a great value and excellent addition to everyone’s nursery and matches pretty much any baby room furniture. 2017 New Designs: Also, with the new custom Stork Craft glider, you can get even more variety of colors and patterns. The Shermag glider is available in different colors. Click here for more information. The Shermag Rocker Glider and Ottoman Set (view here) is a top rated and extremely popular nursery glider in late 2016 and beginning of 2017 as it is made with the highest quality materials (luxurious upholstered fabric) and has ultimate comfort in mind for parents. It is a hot item for anyone looking for the most comfortable chair to breastfeed or nurse your baby. 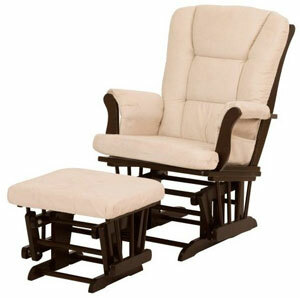 You really can’t get any better when it comes to Shermag, it is the best nursery glider. We currently have it at No. 2 only because as we are aware that price may not appeal to everyone. So basically, if you are looking for the best, the highest quality and the most comfortable baby glider, this Shermag glider rocker is the one. Still we aren’t complaining at all, the price isn’t too bad, for between $300-$400 you are getting ultimate quality. Allthough it is more expensive than the Stork Craft above, the Stork Craft is an affordable option and is one of the cheaper gliders on the market. So the Shermag at a slightly higher price doesn’t seem to put many people off and is still considered affordable in comparison to many other nursery chairs. Highest Quality: As we said, the Shermag glider and ottoman set is the most comfortable breastfeeding chair that is a good choice for someone who doesn’t want to splurge completely (i.e wants to buy a quality but affordable glider rocker) but wants to buy something that is a little bit more of a higher quality baby nursing chair than the Stork Craft above and bought from a highly reliable and popular brand, Shermag. You will see that the price of the Shermag glider is higher than the Stork Craft, this is because the Shermag gliders are made from higher quality materials and are designed and manufactured for ultimate breastfeeding and nursing comfort. Removable Cushions: This chair with matching padded ottoman are made of solid wood and glide on encased ball bearings. All of the plush cushions on this glider are removable for cleaning. The Shermag Glider is roomy and well cushioned for optimal comfort. This is a perfect chair for breastfeeding. Different Colors/Wood Variety: The Shermag glider comes in three different wood color and cushion color combinations. All the colors are neutral and will fit in whatever your nursery theme may be, hence why the Shermag glider is a great glider for a nursery. Space: There is approximately 25 inches between the arms on this chair, that’s a very generous amount of room. The extra thick padding in the cushions makes this chair a top choice for many moms. The cushions are also scotch guarded to protect against spills and stains. We all know how much babies spit up and drool and make messes in general. Stain Resistant: With the comfort of these super stuffed plush soft cushions that are stain resistant and the spacious room between the arms, this chair is perfect for breastfeeding and rocking your little one to sleep. The space alone is very helpful to breastfeeding mothers as they often have other pillows and odd positioning to get baby comfortably latched. This maternity chair can also be locked in to several different positions making for hassle free comfort. Because of the encased bearings on this breastfeeding glider and ottoman set, it offers a smooth and quiet glide that is perfect for getting your baby to sleep. Babies prefer smooth movements and loud clunky rockers can make noises that will actually do the opposite and keep baby wide awake. Priced between $300 and $400, this chair is priced perfectly for the mom who wants luxurious cushioned comfort without breaking the bank. Similar to the Stork Craft Hoop Glider above, the Stork Craft Tuscany Glider (view here) is another very popular and also considered one of the best when it comes to nursery gliders and rockers. Hoop v Tuscany: The main difference between the Tuscany and the Stork Craft Hoop glider are the way the backs are made. The Tuscany has a higher top back that is square, instead of rounded. Easy to Clean: The cushions on the back of this chair and on the seat are also spot washable, which is a plus for nursery chairs. Babies have a way of making a mess and this feature is highly convenient for moms who just want to be able to clean it up without having stains and messes all over the place. 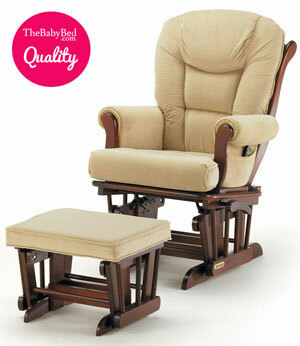 Good Value: This wooden glider rocker glides on metal bearings that are completely enclosed for safety. Spacious and comfortable, it is an upholstered rocking chair which is another excellent choice for breastfeeding moms who are trying to stay on budget. It’s a little more expensive than the Hoop glider and ottoman set, but it’s not much and sometimes, it’s about style. This chair also comes in a variety of different colors (view all colors here) and will fit in no matter what room you choose to put it in, whether it be the nursery for your little boy or girl, or in the living room when they get older. Just as its sibling chair, there is some assembly required, but it is not very difficult. The 3rd last chair on our list (updated 2017) is the Status Roma Glider and Nursing Ottoman (you can view it here). This specific Glider set is tailored specifically to the needs of the breastfeeding mother. It is generously cushioned, features pockets on the sides of the padded arms, and the ottoman has a slide out nursing stool. Nursing Stool: The nursing stool is an excellent feature for breastfeeding mothers because sometimes it is all about the angle of the legs in combination of the arms to properly support your child and the pillow that they are laying on. The fact that the stool slides out easily is excellent when you’re trying to maneuver with the pillows and your legs as well as a crying, wiggly, hungry baby. Smooth Gliding: This nursery glider rocker that is available in the very popular white glider and ottoman glides on encased bearings making it glide smoothly and quietly. Pockets: The pockets on the side of the padded arms are excellent for storing bottles of water for mom or other nursing materials or even reading materials for mom to keep her entertained while she is feeding the little one. Reasonably Priced: You can get the Status Roma chair as a glider rocker for the nursery at a reasonable price (check price here) and is pretty cheap glider for the benefit you obtain. Colors Available: It also comes in a variety of wood and cushion colors that are perfect for matching to the furniture in the nursery and fitting in well with the overall décor of the room. Micro Fiber Cushions: The cushions are filled with a microfiber blend of fabric that is easily spot cleanable for any little mishaps between mom and baby. The Status Roma definitely had breastfeeding mothers in mind when they came up with this innovative chair and ottoman set. Overall, the price is excellent and costs less than many other chairs on the market (check price here) that don’t have this extra utility included. The chair is designed to cater to the comfort and convenience of breastfeeding mothers in mind and it is highly recommended for moms who wish to breastfeed and even mothers who don’t. The foot rest is a nice feature for comfort overall. This stylish and comfortable chair is very unique not only on our list but in general. 2nd last on our list (updated 2017) is the Naomi Home Deluxe Sleigh Glider and Ottoman Set (view here). This is a beautiful glider of solid wood and extra plush cushions. This chair for the baby’s room is very stylish and high quality and comes in a variety of colors to suit your own décor and style. 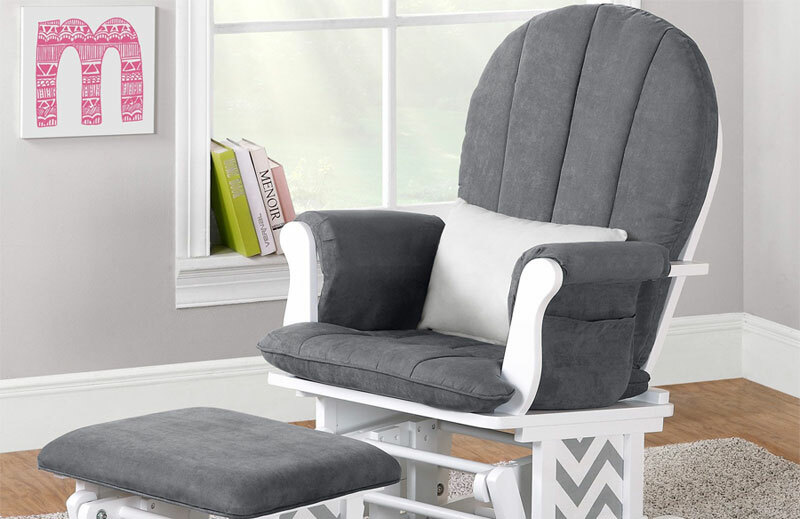 Side Pockets: This nursery rockers and glider chair offers style, comfort and functionality. It has pockets on the side of the padded arm rests to hold your belongings. This is makes setting things down for a feed, after a feed or for rocking baby to sleep so much easier as you don’t need extra tables in the area and you aren’t required to place your belongings on the floor. Glide Functionality: This glider rocker with ottoman also glides and can be locked in to several different positions for optimal comfort for both mom and baby. It rocks quietly which is an exciting plus as we all know sometimes the slightest noise can awaken your sleeping baby, thus depriving mom of precious sleep. Easy to assemble, coming with everything you will need, this chair has a tall back and wide seating space to ensure optimal comfort on its plush cushions. This chair really has it all and is among the favorites of so many, it is definitely one of the greats. Another great chair similar to the above chair is the Dutailier Round Back Cushion Design Modern Glider which comes with 5 YEAR WARRANTY. (New Update 2017) We have decided to extend this list and update it to add another great glider for a new addition in 2016. This time from a brand that is relatively new on the market but is already proving to be extremely popular, especially among new and young parents (maybe it’s the different designs that have got parent’s hooked all over the world). Being relatively new to the market, we haven’t written in detail so much before about this brand. We have featured the wooden cribs by Babyletto before but in regards to other baby products such as a Babyletto Glider, we have waited for parents worldwide to decide on the quality. And now that parents have spoken, it seems this Babyletto Glider is ranking #1 as the best selling baby glider already in 2017 so far. Swivel Glider: The thing about this Babyletto glider is that is differs vastly from the rest of the gliders above. Firstly it is a swivel glider instead of a rocker and glider. Materials: Secondly it is made from 100% micro suede. What does this mean? It means this: not only is it super soft and luxurious to feel, but it’s got the added benefit of being water-resistant and stain-resistant. There also is no boundaries or restrictions with this swivel glider as it moves 360 degrees around and comes in a few different colors to choose from. Matching Ottoman Available: The Swivel Glider comes with a matching ottoman but you need to purchase this separately. The glider is great value for the quality and comfort that it brings. These chairs are just for looks; they allow you to have a comfy place to sit and rest your arms while you feed your baby and you can rock them right to sleep in their room. Since the chair is in the nursery, you might have just a few steps from chair to crib. Voila. The baby is asleep and you can now go get some much needed sleep too. 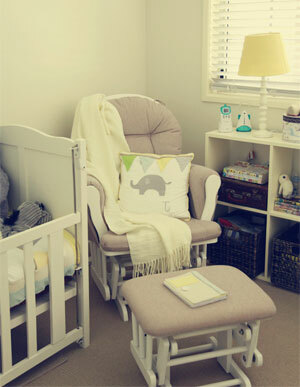 These rocking chairs for the nursery are also convenient for during the day as well. Babies eat a lot and new moms spend a lot of time just sitting and holding their little one, they should have a comfy spot to sit and put their feet up. Finding the best nursery glider chair for you comes down to what your needs are specifically, but as you can see, all of these rocker glider and reclining nursery chairs are all modern looking meaning they won’t date in between children (they are the latest and newest models as of 2017). You can find all different kinds of nursery glider rocker and recliner chairs with different features, sizes, and styles for any budget. There’s really no reason to compromise on anything when it comes to such an important piece of furniture that is really for mom and baby both. You can always find the best of both worlds when it comes to features and price and this list really shows the variety of what is out there. Look around and find what will work for you, there’s so much out there to choose from. I am interested in Nursery glider chairs for a Labour ward with a stool made of solid wood could you help. Sure, it would be my pleasure. It all depends on your budget. 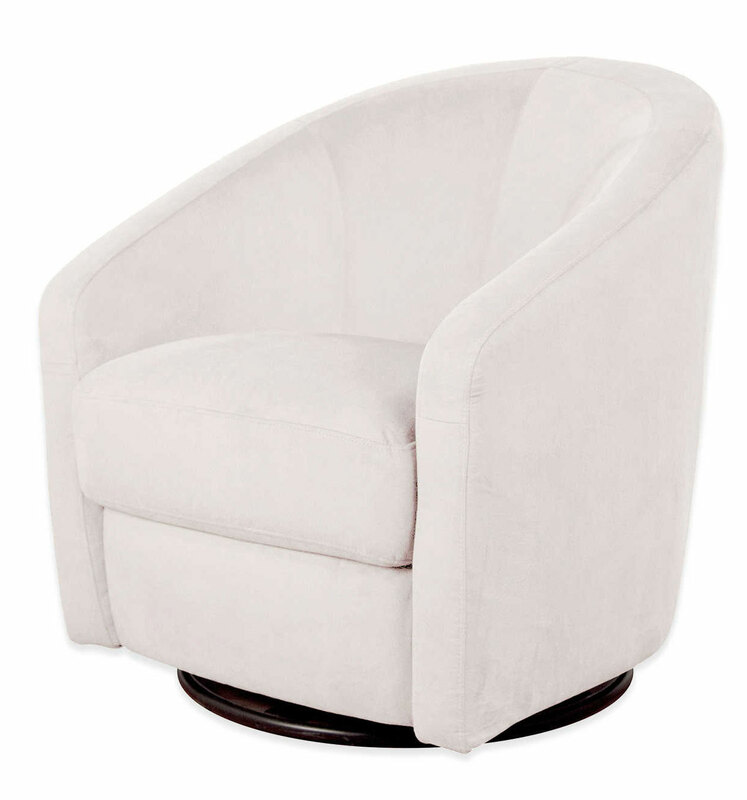 The Shermag (#2 above) is made of the most highest quality solid wood and also the most roomiest glider and stool combo but in saying this the Hoop (#1 above for an affordable option) and Tuscany (#3 above) are both made of solid wood construction also. I would recommend probably going for a mid-range glider which is made from good solid quality wood, the Tuscany (#3 above).